Let's Dance in This Dress! Oh man, do I love this dress from ModCloth. Maybe it's the Pisces in me, but I adore the different shimmering shines of the sequins. 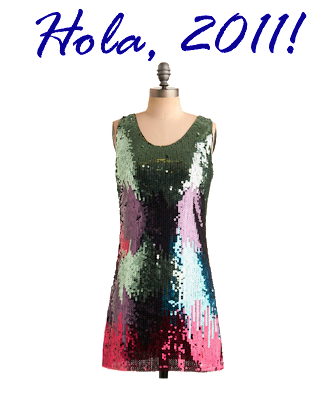 Wouldn't it be fun to dance away 2010 in this sparkle shift? Paired with black tights, black heeled booties, and a blazer with the sleeves rolled up, and you've got a perfect New Year's Eve look!